I have a short and sweet store update for you today. 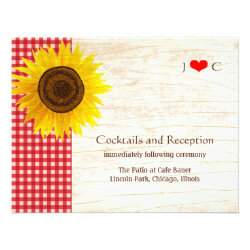 We have new invitation sets! The first one is actually from last week and it features mason jars, sunflowers, and red gingham — perennial rustic summer wedding favorites! The set comes with an invitation, an RSVP card, a reception card, a save the date card, address labels, favor and envelope seals, postage, table number cards, and other elements. All items can be customized online, just replace the names and details with yours in the provided text fields – yup right from the comforts of home. Please visit the shop to see the entire set. The latest suite is inspired by all the beach weddings I’ve been featuring on this site. 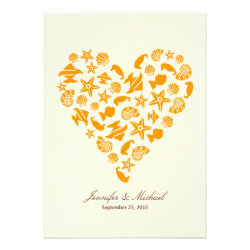 This set features seashells, starfish, and other marine life forms arranged in the form of a heart. Everything is bathed in sunny yellow and orange hues. 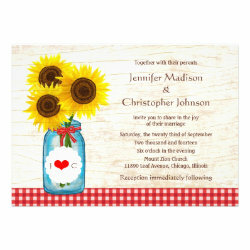 Elements include an invitation, an RSVP card, a matching envelope, address labels, seals and stickers, stamps, and more. Visit the shop to see the entire collection. And as promised, I have a printable for you to match this beach wedding set. Cupcake flags and cocktail glass tags! The starfish-and-seashell-pattern cupcake flags will cheer up any beach wedding dessert spread. The name tags, meanwhile, will prevent lost or misplaced cocktails once your beach party is in full swing! Grab the printable from our freebies section.